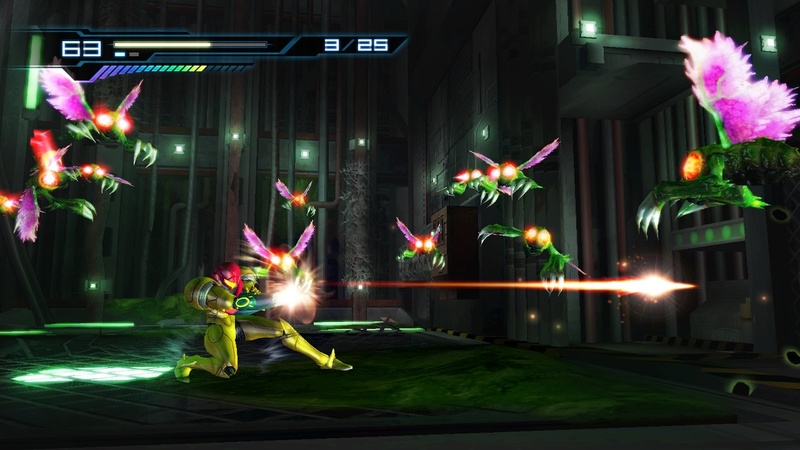 When Metroid: Other M was released on the Nintendo Wii in 2010, it looked to bring a greater emphasis to storytelling and character development to the Metroid series. Up to that point, every Metroid release was a quality title to one degree or another (the original Metroid may have aged poorly, but there’s no denying the influence of many of its ideas). So a story-focused Metroid title seemed like a promising concept. Unfortunately, Other M proved that anything is possible by delivering the first bad game in the Metroid series. It’s such a misstep that Nintendo has seemed at a loss as to how to salvage the series almost six years later. Chronologically, Other M takes place after the beloved Nintendo classic, Super Metroid. After having defeated Mother Brain with the help of the last Metroid, which sacrificed itself to save Samus in that game’s finale. The effect of the baby Metroid’s sacrifice seems to have had a deep impact on Samus, as she seems to regularly reflect on the incident with one needless, exposition-laden monologue after another. Samus receives a distress signal coming from a space station called the “Bottle Ship,” and investigates. There she encounters many of her old allies from the Galactic Federation military, from her days before bounty hunting. She becomes embroiled in the Galactic Federation’s mission to investigate the Bottle Ship, as the facility is suspected of conducting illegal bioweapon experiments. The meeting between Samus and her old military buddies is used as a means to give us insight into Samus’ past, but all it ends up doing is contribute to Other M’s devolving of Samus’ character. The Samus of Other M all but destroys the intrigue of the character. Long-considered to be one of the strongest heroines in gaming, Other M reduces Samus into a whiny, insecure crybaby who lacks any independence. You can sum up this evisceration of character by the way Samus gains additional weapons and abilities. In most Metroid games, Samus finds upgrades to her armor and weapons throughout the game world. Here, Samus still supposedly has all of the abilities she gained in Super Metroid, but she denies herself access to them until her former commanding officer gives her the okay to do so. Samus even endures health-depleting heat in lava-filled craters for a good while before she is given permission to activate the heat-resistant capabilities of her suit. Why Samus lacks the independence to activate such abilities on her own in order to save her life in a hostile environment destroys both her character and logic. It also doesn’t help that Samus speaks in the most lethargic, monotonous, and poorly-acted voice imaginable. She also seems to constantly be talking about how she’s feeling about every situation as it happens, because who needs subtlety? It’s some of the worst character building in video game history, made all the worse by the fact that it diminishes an iconic video game character so greatly. 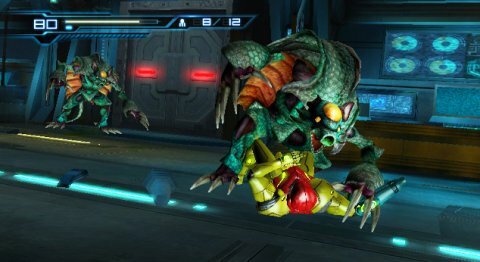 I seem to be rambling on about the story and character development (rather, the lack thereof), but how does Metroid: Other M hold up as a game? Well the good news is it’s better than the narrative aspects. The bad news is that’s only because of how abysmal said narrative is. The gameplay works as a third-person action game, with Samus being controlled by holding the Wii remote sideways. Samus’ standard actions include jumping, shooting, and turning into her morph ball form to plant bombs and squeeze into small spaces. Additionally, players can go into first-person mode by pointing the Wii remote forward. When in first-person mode, Samus can look around to investigate, lock on to enemies, and shoot missiles. But she can’t move in first-person view. This makes the gameplay feel slow, clunky, and segmented. You’ll frequently be fighting waves of enemies (with many of them taking far too long to kill), where you’ll be charging your laser repeatedly, then switching to first-person view to fire a missile. It not only works awkwardly, but one of the seemingly countless enemies can easily hit you when in first-person. The combat segments are just overlong and riddled in poor mechanics. To pour more salt on the gameplay wound, players recharge Samus’ missiles by pointing the Wii remote upward and holding the A button. 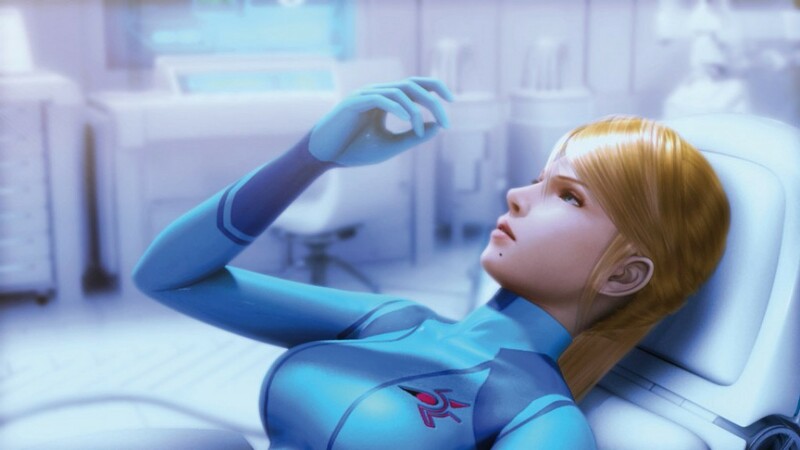 This same action can be used to heal some of Samus’ health when she’s in critical condition. There are so many instances where you’ll be trying to charge your missiles, refill health, or go into first-person view only to do one of the undesired actions that it becomes exhausting. Other M also feels incredibly straightforward when compared to the Metroid titles that preceded it. There’s a bit of backtracking to be done, but for the most part you’ll just feel like you’re constantly pushing forward, with the exploration aspects the series is famous for being nowhere to be found. Perhaps the worst part of the gameplay are moments that force (yes, force) players into first-person view so they can search an area for a clue of where to go next. Not only can the player not progress until they find the item in question, but said items are largely left unexplained to the player, and the objects you’re usually looking for tend to be the size of a single pixel, making it easy to get stuck in these moments for up to ten minutes at a time! While the storytelling is atrocious and the gameplay is frustrating, Other M can at the very least boast about its production values. The game was one of the better looking Wii titles, and you’d be forgiven for thinking the cinematics came from a PS3 or Xbox 360 title. Though it’s hard to care too much about how fancy the cinematics look when the story they’re telling is such a stinker (not to mention they’re unskippable). It’s a great irony that Samus has never looked more beautiful than she does in Other M, considering this game is the one blemish on Metroid’s record. Some of Nintendo’s critics say the Big N no longer cares about the series, but I think they simply want Other M to become a distant enough memory so the series can pick itself up. You could find worse games than Metroid: Other M. But you’d be hard pressed to find another game that bares the name of one of Nintendo’s most revered franchises that fails so devastatingly. I haven’t played this game, and I still don’t intend to. I watched a Let’s Play of this game, and you’re absolutely right; the storytelling is appalling (things that are blatantly obvious are explained too much, the narrative clams up when something actually would need an explanation, etc.). Ever since playing games such as Half-Life and Planescape: Torment, I’ve found that telling stories primarily through non-interactive cutscenes is ineffective for the medium because it rarely, if ever, takes into account the player’s impact on the story. Half-Life tells an interesting story without ever wrestling control away from the player so you can experience every development in real-time and without anyone commenting on them. Meanwhile, Planescape: Torment is like an interactive novel whose plot details change depending on the reader’s actions. Indeed, playing Undertale only seems to have reinforced this sentiment. It has something of an interesting development story in that it was apparently made to boost sales in Japan, as the series has historically been more popular in the West. The irony? Japanese fans didn’t really care for the game either; turns out they wanted another Super Metroid-style installment. Whoops! Ouch! That’s seriously harsh in my opinion. Metroid Other M may not be the best game ever made, but honestly I enjoyed it a hell of a lot going in with low expectations. Yes, the narrative is told terribly (I actually think the story itself is fairly decent), and those mandatory first person pixel-hunt sections are terrible… but other than that I thought the game was pretty great, one of the best games on the Wii even! What sums it up for me is this idea of Other M being a “modern take on an NES game”. For me, the game completely delivered on that promise. I loved the immediacy of the controls, with everything so fast and satisfying. Combat-wise, I thought the switch between third person and first person worked great (especially because the game goes into slow motion for a second when you enter first person, it gives you a fighting chance). I also thought the lack of health pick-ups was an inspired way to add tension to the enemy encounters and prevent tedious health farming from Metroid games past. I can see why this game was divisive – there’s nothing else quite like it – but for me Other M is easily an 8 or 9 out of 10. LOL, wow. We agree to disagree on this one then! Even bad games can be worth a go. In fact, it can actually help you appreciate the qualities in good games all the more. Update: I know I said I had no intentions of playing this game, but I changed my mind and ended up checking it out anyway with the goal of writing a review of it once I finished. Regardless of what I may think of its story, I don’t like to pick on a game I’ve never played. In any event, I found it lives up to its less-than-stellar reputation.